Trump Finally Breaks Silence On Rob Porter: Everyone Knows I'm Totally Opposed To Domestic Violence - Joe.My.God. President Trump gave his first personal, full-throated condemnation of domestic violence Wednesday since the controversy surrounding former White House aide Rob Porter. “I am totally opposed to domestic violence of any kind, everyone knows that. And it almost wouldn’t even have to be said. So now you hear it. But you all know it,” the president said in a White House meeting about opportunity zones with business leaders. 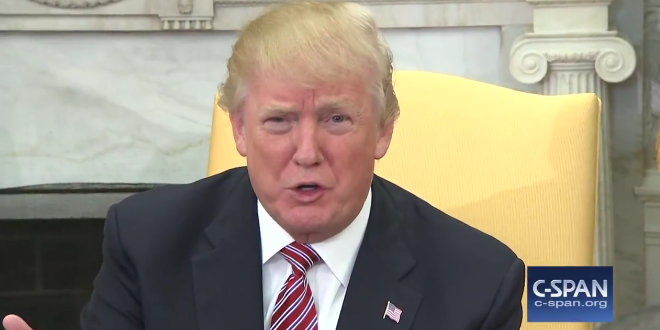 The president made the remark in response to questions, as he sat with Sen. Tim Scott, R-South Carolina, in the meeting about encouraging economic development in low-income areas. His daughter and aide Ivanka Trump was also in the room. Took Trump NINE days into a scandal swamping his White House to say it. Just another day in Trump’s White House.